You know how I just wrote about how I like getting a handmade gift more than just about anything. Well, this is anything. Sitting on the couch on a lazy Sunday, knitting with my kids . . . that beats gift-getting for sure. It is a gift itself. We just sat there side-by-side, for about an hour, feeling the warmth from each other’s bodies, listening to music from my computer and basking in each others company as the sun streamed through the windows. Ahhh . . .the experience was so delightful, it was hard to peel myself away to take the photos. That blue pile is my spot in the middle. You can look for a fun collection of easy knits coming soon from me. 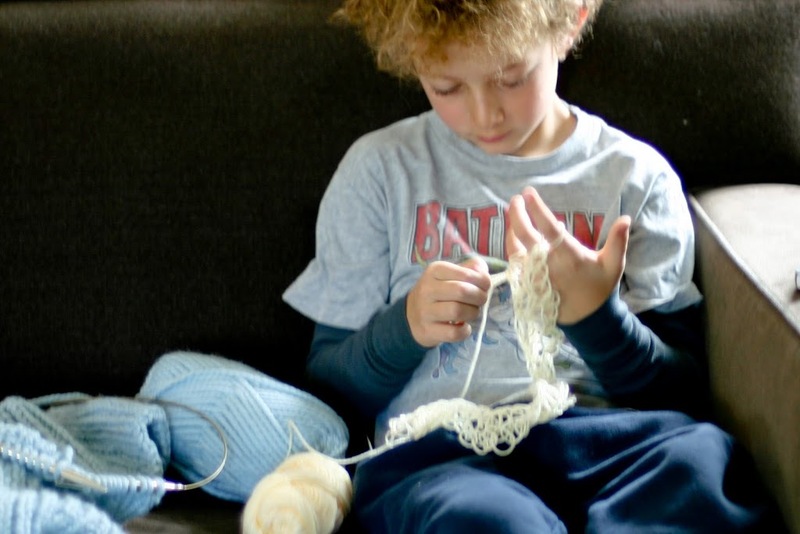 The two kiddos are finger-knitting, which I’ve written about before and again, but it continues to be a favorite activity. 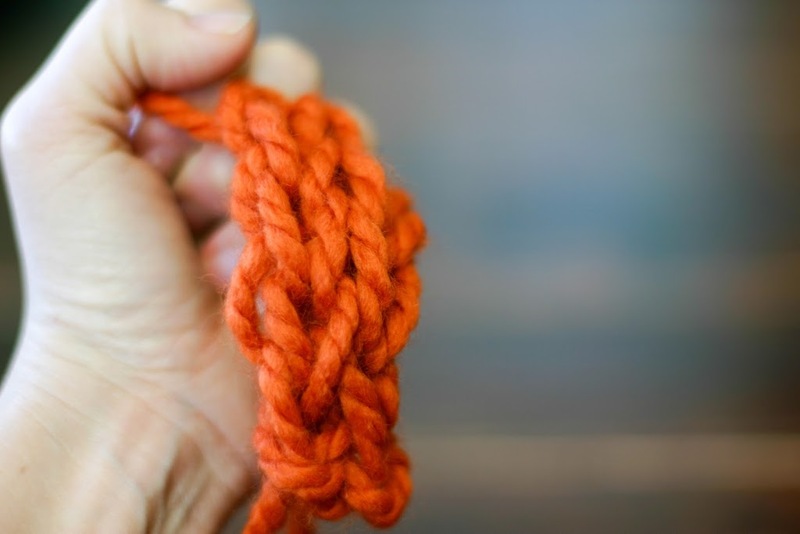 It is a really easy way to make something from nothing, quickly, especially if you use a super-bulky yarn. I figured it was time to provide instructions to you all, since my family consistently gets so much joy out of doing it. I’ve provided a finger knitting tutorial below. You end up with a long coil of knitting like this, that curls itself into a sort of tube. My son is using a finer and less expensive yarn, here. You can pretty much use whatever yarn you have sitting around to do this. They really do enjoy the process. Often, they will finger knit as we read to them. It keeps their bodies still while still allowing them enough space to pay attention. Some day, I’ll make a coiled rug from the pieces. I thought Allie’s use of the thick and chunky yarn might allow that, but she wanted to use it as a scarf. Cute! And, yes! that’s my tree, still up. Okay, okay, the decorations are coming down today. 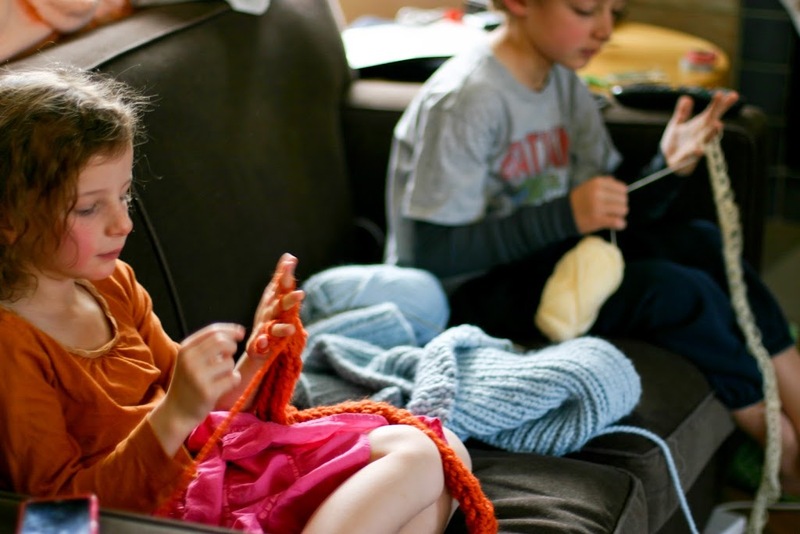 But I wouldn’t have given up my time on the couch knitting with my kids for anything! **UPDATE: So many people have asked me for a PDF of the below how-to so they can take the directions on the road for their kiddos. I finally did it! You can purchase the Finger Knitting How-To PDF in the Flax & Twine Etsy shop here. Thank you so much for your support. You can always just follow along with the photos below! Time: However long you want! I think that super-bulky yarn is a good weight to start with. Its easy to work with on the fingers and your kiddo will get something done pretty fast. 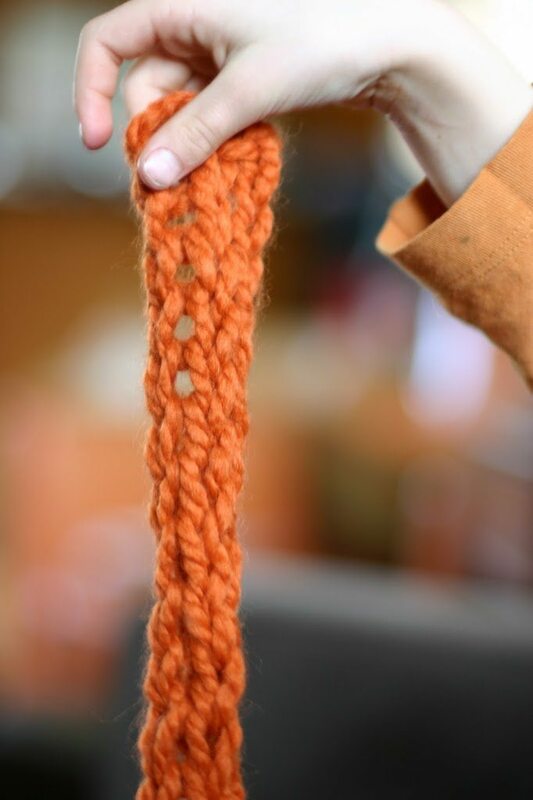 Start by placing the yarn in between your thumb and hand, such that the tail hangs behind your hand. Pick up the yarn that goes to the ball, leaving the tail in between your thumb and hand. 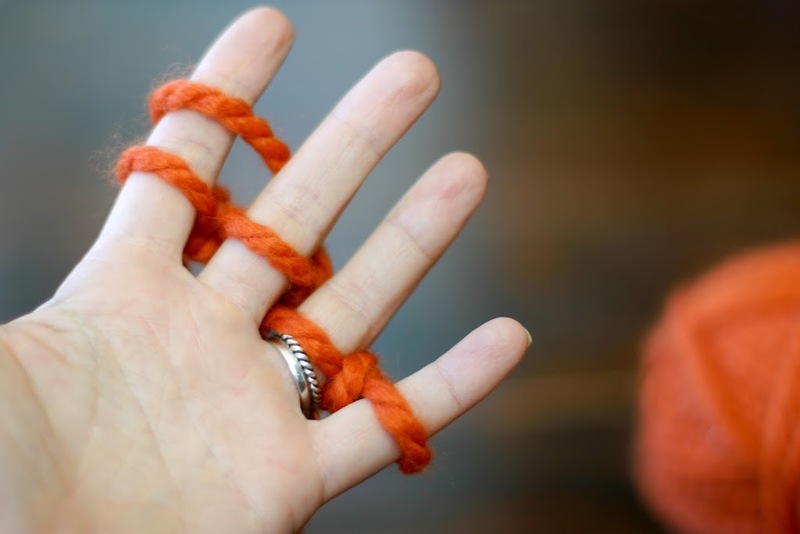 Bring the yarn behind your middle finger and over your ring finger. 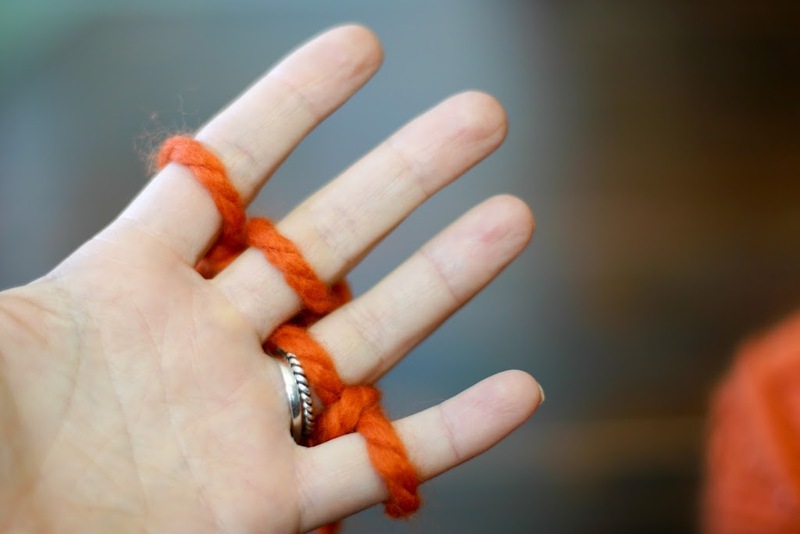 Now, bring the yarn around your pinky, behind your ring finger and over your middle finger. Next, bring the yarn around your index finger. Now, we’re going to head back again. 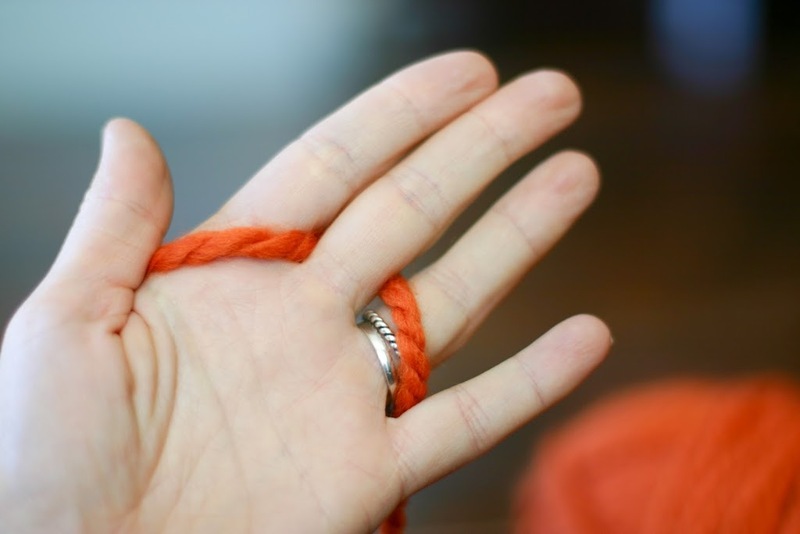 Bring the yarn behind your middle finger and over your ring finger. Then, around your pinky, behind your ring finger, over your middle finger. 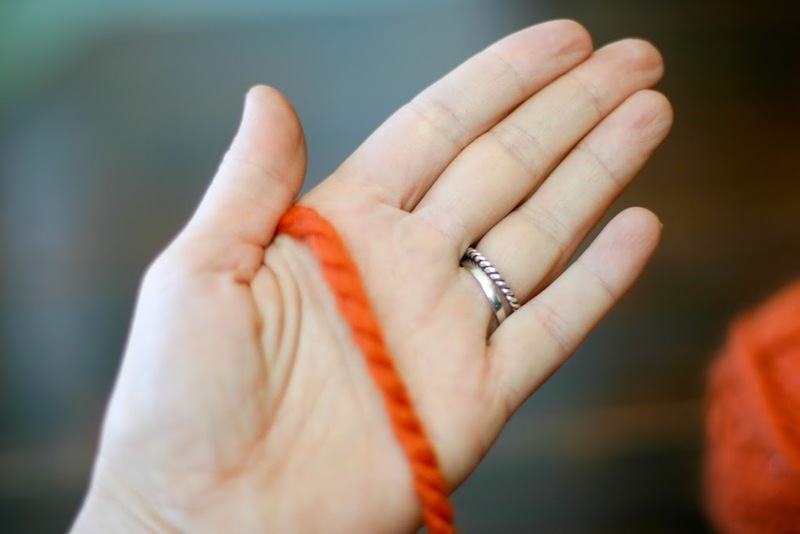 Starting with your pinky finger, bring the lower loop on your finger over the upper loop and over your finger. 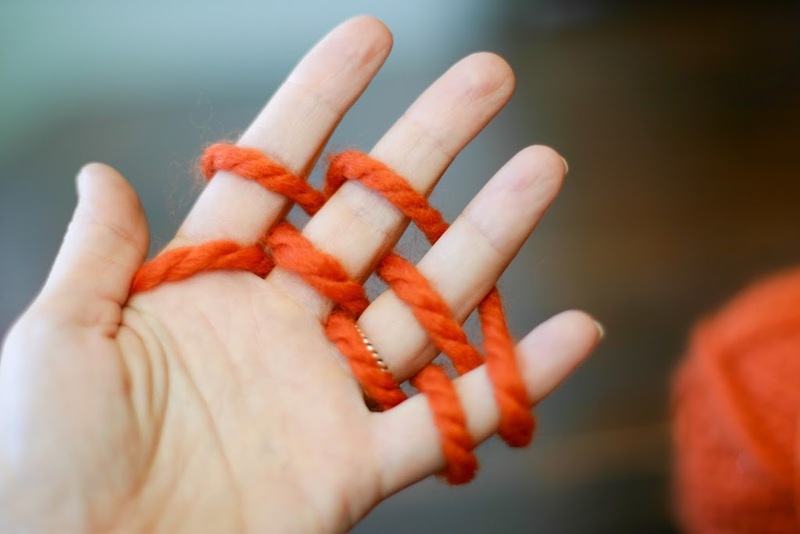 Continue this process on each finger, bringing the lower loop over the upper loop and over your finger. Bring the tail in between your index finger and your middle finger. This is your home base. Now, repeat. 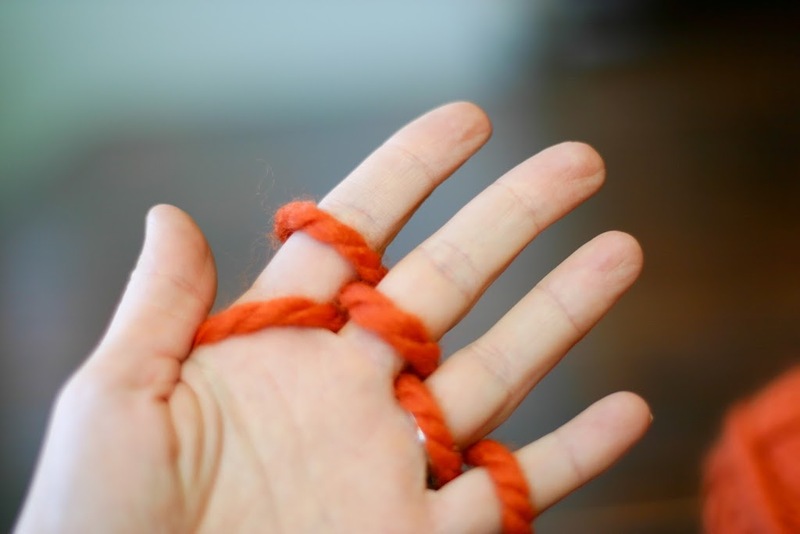 Wrap the yarn around your index finger. 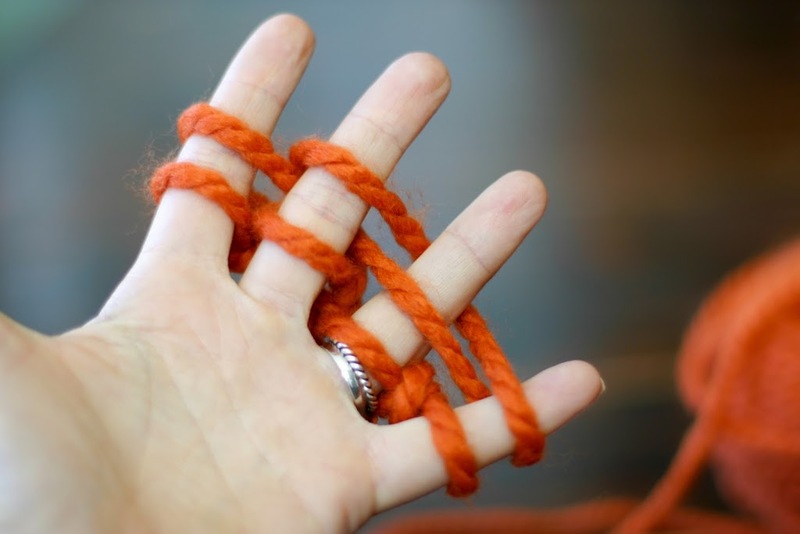 Proceed to repeat the over and under until you have two loops on each finger. Pull the lower loops over all the upper loops and over the finger, starting at the pinky. You end up back at home base and you just keep repeating. This is how the back looks. This is how the opposite side of the finger knitting looks. To finish, cut the yarn and bring the end through each of the loops. 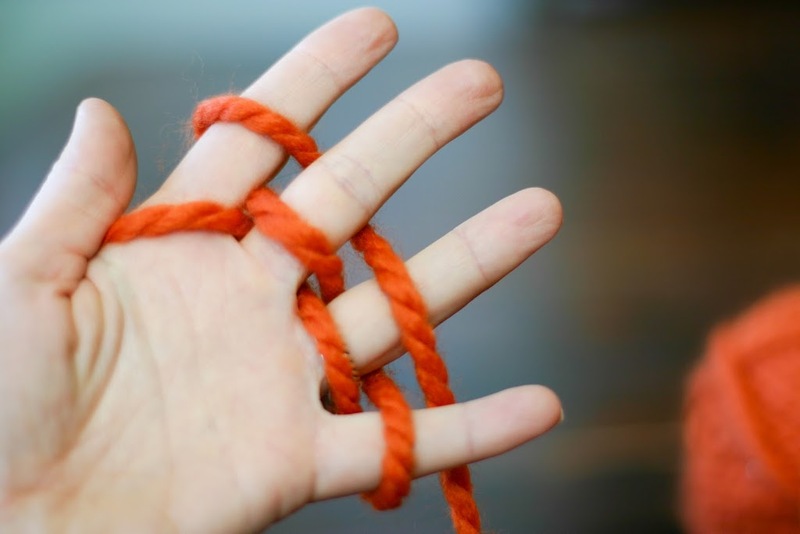 If your child wants a break at any point, bring a pencil or pen through the loops in this same way and set aside. Then, easily place the loops back on the fingers when you want to continue. 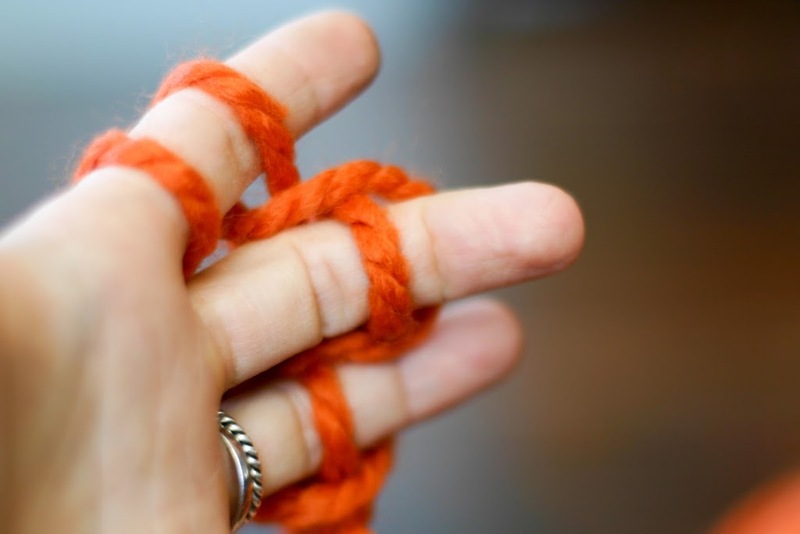 Take the loops off your fingers and pull tightly. Voila – there’s your finger knitting chain. My kids have gotten fancy and done two colors at the same time, or braided three lengths of finger knitting together or made HUGE balls out of their finger knitting. The fact is, its all fun and a great way to start those little ones knitting. Allie started finger knitting when she was 4. Give it a whirl with your young ones. And here’s to wishing for many more lazy knitty Sundays for you and yours! My girls love to finger knit. In fact, they can do it all day long. But then we have these long tails of knit and there are only so many scarfs they can keep. Any ideas for fun projects with them? I think these would be great to have around the house especially if your girls can show them off to guests. Great idea! That’s so funny because its one of my projects :). Check out the Five Fabulous Finger Knitting Projects on the sidebar of the blog. Three are up there now, but more to come! love that idea! It’s fun to finger knit with cotton rope, twine, jute, leather. Play around with it and see what happens! Thank you so much for your comment! You’re compliment makes me glow! It is totally normal for the finger knitting to curl as it goes. It curls into a tube. I’m working on an easy way to make a fuller fabric – but that is to come! Aww, thanks for your help Anne, good to hear I’m not doing anything wrong! sorry! I don’t know Spanish! I’m hoping you can follow along the photo tutorial! Hi, sorry, I don’t speak Spanish. The photos should be able to do the trick, though. patio table 6 head-bands–put on a couple beads…they’ll be great!! never tried this way of knitting yet, but I find it rather facinating and will definitely try this method. Perhaps your girls could make them then deliver them to a church to be distributed to the homeless. We have many churches in our community that help the homeless. You raise a wonderful point. I have the same issue. I have a few things in mind to give new and exciting life to those long strands. They are going to be super fun. Will come soon! Úžasné výrobky a jedinečné postupy pro děti. Just taught my girls (7 & 4) and myself using your directions…we have a new addiction! Yay! enjoy. Will definitely have to come up with some uses for finger knitting other than scarves, and soon! Thanks for the reminder, I want to teach my grandchildren how to finger-knit. Oh, and don’t feel pressured to “take down” Christmas… at my home we leave everything up until Epiphany, when the kings finally arrive to pay homage to the Christ Child. So we get 12 full days of Christmas, and no pressure to hurry the good feelings out of our house. Now, waiting past January 6th would make me feel like I am being neglectful… but until then… relax, enjoy this time with your family! It’s the best way to keep kids busy! I adore finger knitting. Just wandering if you know about arm knitting. I’ve read about it, but I can’t find instructions. Do you know how-to? I’ve been doing this since 2nd grade at summer camp. LOL. However, I call finge CROCHETING instead of finger KNITTING. So fun to do though! Glad you are all enjoying it. I have no doubt that your children will too. I do know how to arm knit. Its hard for me to show on my blog because you need both hands and then I can’t take photos! I will see if I can figure out a way to show you all. Maybe a video? Or, maybe I can get my hubby to take the photos 🙂 we’ll see . . .
I’m going to try this with my kindergarten class. They will love it! Thanks. so get this…my 11yr old grandaughter tried to teach me this and got so fustrated with me she said “Mars (thats what the grandaughters call me), i give up, maybe your too old to learn” wwweellll then…i showed her. i added 3 different kinds of yarn (once i figured out how to do it) and made 24, yes 24 very long scarfs for everyone that showed up at Christmas. her reply then…”wow Mars you did it”. Thanks for posting the tutorial! I saw your link on craftgossip and can’t wait to try this. Mars, what a great story! how wonderful and what kind gifts for everyone – thanks for sharing. Thanks for the awesome tutorial! I’m going to try this with my class, I hope they’ll manage! I remember doin this as a child! Thanks for the memories! I’m a long time crochet freak and my husband is a knitter but neither of us had ever done this. It was nice to sit and watch tv and finger knit at the same time! Will definitely be a fun thing to teach to our someday little ones. Thank you for sharing! How fun-I’m going to set my 9-year-old down to try it. She has tried knitting but gets frustrated with tangles so this might be perfect to ease her in. I just took my Christmas tree down-we leave it up for the 12 days of Christmas also. Love having it up, love taking it down to deep clean my living room. Peaceful reader – I hope your 9-year old loves it! I think she will, because I find this cuts down on knitting frustration a lot! They feel good accomplishing so much. Phyllis, thanks you so much for the award – you are so kind to think if me. I will do some posts soon on ideas for what to do for finger knitting. A rug is one of them – can’t wait to try it! Thanks for sharing. I will share the technique with my 4 year old great neice. She loves handknit scarves and hats. Came here from Phyllis’s blog and had to comment on this post. My just turned 12 year old daughter LOVES to finger knit. She has been doing it for about 4 years. She even sells her scarves at our Homeschool Skate Day. One thing she does is use 2 or more colors at once. She also makes pom poms to attach to each end. I loved seeing the photos of your kiddos doing this. Now Keilee has learned to knit and she is finger knitting less and less…but she loved it so! I have little finger knitted goodies everywhere! Cool, I just realized that blogger must have updated its ability to respond to individual comments! I love your story here, karen! Thanks so much for sharing. Great idea to add the pom poms to the scarves. Now that she’s learned to knit – watch out!! fun 🙂 but how would you tie it off? Maybe you could you whip stitch a few together and make bags, rugs, shawls! 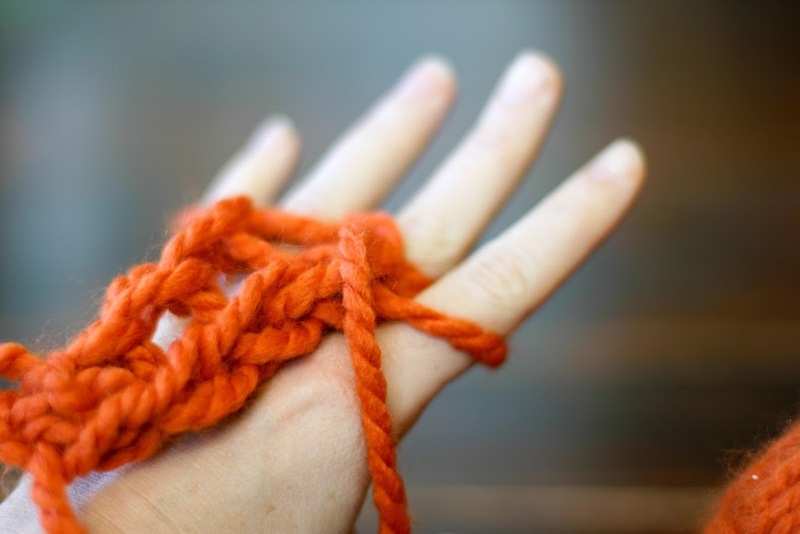 Anonymous, You tie it off by slipping the yarn through each one of the loops on your fingers. The best photo of it is the third to the last photo in the post. Let me know if you have any further questions! 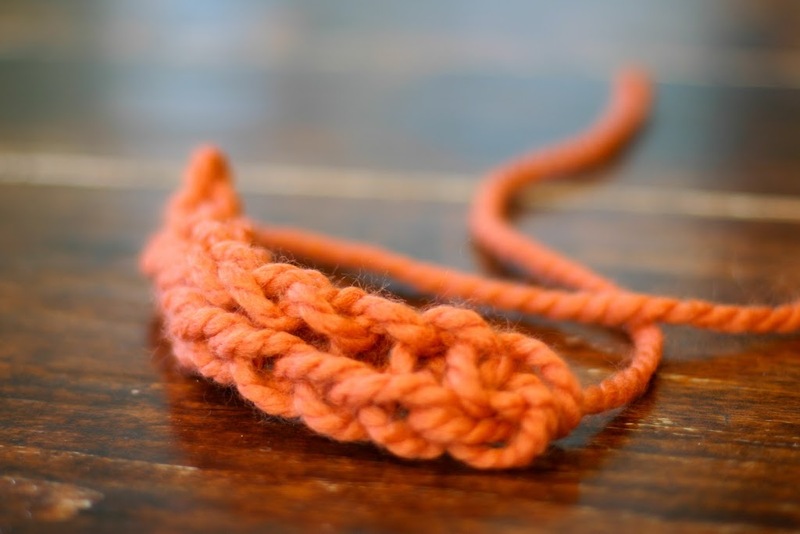 I just stumbled onto this other tutorial on craftgawker, and it seems to me that you could braid three strands of your fingerknitting together to make a bulkier scarf ala: http://knucklesalad.com/njickis-braided-knit-scarf-pattern/ I’ll give it a try just as soon as I can get some bulky yarn. Thanks for the inspiration. I showed my kids how to do this & they LOVE it! And we are not very crafty. Thanks so much! It’s a great activity to do together! So so glad your kids are loving it. have fun! Love it! I remember doing this as a kid!! I posted a link to this on my blog…thru my pinterest board. Worked on the rug this weekend with the kids! Thank You! 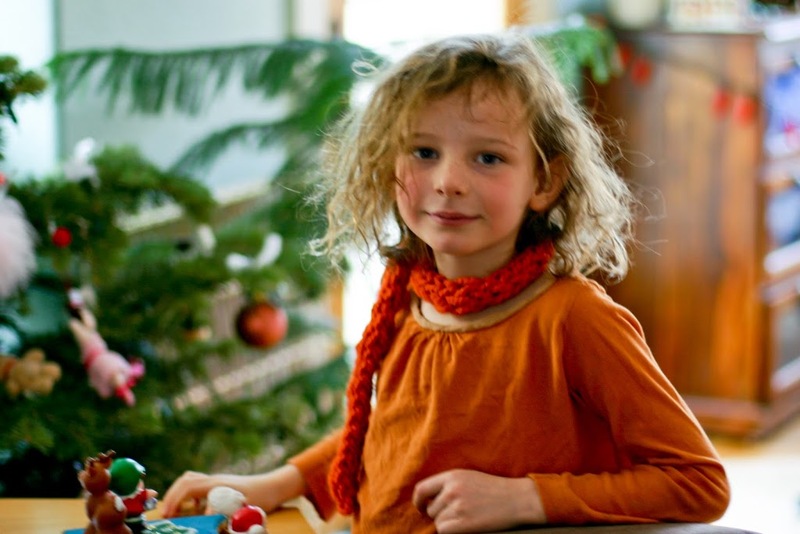 Just taught my 5 year old and she loves it, she picked it up really quickly – so much easier than trying to teach her knitting and crochet. Thank you so much for this thorough tutorial! I do ALOT of crochet and my grandkids (ages 7 an 9) always ask me to teach them. I’ve tried several times but think they are too young to really get the hang of the fine motor skills necessary. This is a GREAT skill and craft to teach them now. It works up fast and they get to see their work come to fruition. We are having a hand knitting date tonight! Love this! Can’t wait to try it with my kids! Having one problem though – the parts coming off my index finger are loose and I can’t figure out how to tighten them. Any suggestions? Jodi.Have fun with the kids! My suggestion is to give the ring finger loop a little extra pull as you bring it over your ring finger. This will tighten the loop on your index finger and should limit the size of that loop. Let me know if you have any further questions. I love that. Yes, its a good way to pass time. I tell that to my daughter all the time. Great idea with the knitty knobby chain – hope he has a ball with it! I do inhome childcare and have a family that the kids have been fingerknitting here for a while now. They have taught some of the other kids to do it to. It would be fun to make something with them so I will be watching out for some good ideas fo do with them. Thanks for the great detailed directions so I can now learn to do it with them. This fun but it is turning out very messy as it comes off the index finger and real nice as it comes off the pinky finger. Can’t solve the problem by giving the extra pull when I take if off the ring finger. Tried doing this with the index and middle finger both-still no luck. Always have a huge loop as I take it off the index finger. What am I doing wrong. This would be so neat if I could get it right. HI! My suggestion is to give the ring finger loop a little extra pull as you bring it over your ring finger. This will tighten the loop on your index finger and should limit the size of that loop. I hope that helps you. Good luck! Awesome! I am going to try this and then teach it to my two nieces! I adore this !!!! Plus, I can’t believe my lifetime of crafting (and my Mom’s) that I’ve never done this !! I just ran to my stash of yarn and immediatly started and love it !!! My grand daughter was just wanting to learn to knit but as I was ‘teaching/showing’ her all the intricacies she was torn between the tv and me…I lost. Now THIS with sure to keep her attention !! Thanks so very much ! Yay! Have fun. It is such a great way to introduce kiddos to yarn and making great things!Have a ball. I do this with the potholder loops that are used in the plastic looms, makes great headbands. Sounds great. I’d love to see the headbands! We made a snake for my son this way. Super fun! If when you finish an adequate snake length, you weave so there are 4 loops on each finger then move the bottom yarn over the top 3 times. Weave the yarn through a normal two loop cycle. Tie off. Opt, go through the ending loops with a “tongue color” this technique gives the snake a triangle head! great idea! Thanks so much for sharing! Hello, Thanks for this. I did this recently with my girls and she has been knitting for hours ever since. She got excited yesterday at the store when she found the bargain bin of yarn. Hilarious. I hope you don’t mind. I do a pin of the week on my blog and I used yours for it. Hope that’s OK… I linked it to you to make sure everyone knew, I did not come up with it. Thanks again! So glad she loves it! Thanks for sharing on your blog!! I’m babysitting a 7 year old for three days next week!! I think finger knitting should keep her busy for a while!! 🙂 thanks for sharing!!! Hello, I glad you meet you on this blogger! This post is really great and inspiring me! Thanks a lot! This is really cool.. the tutorial is great.. but if I want to take this with me.. where I didn’t have my computer.. or maybe I did, but had no net-access.. I wouldn’t be able to show it (or having a reminder to access).. have you considered maybe making this into a downloadable PDF? hello anne, whoa what a good blog you have here! Hi! 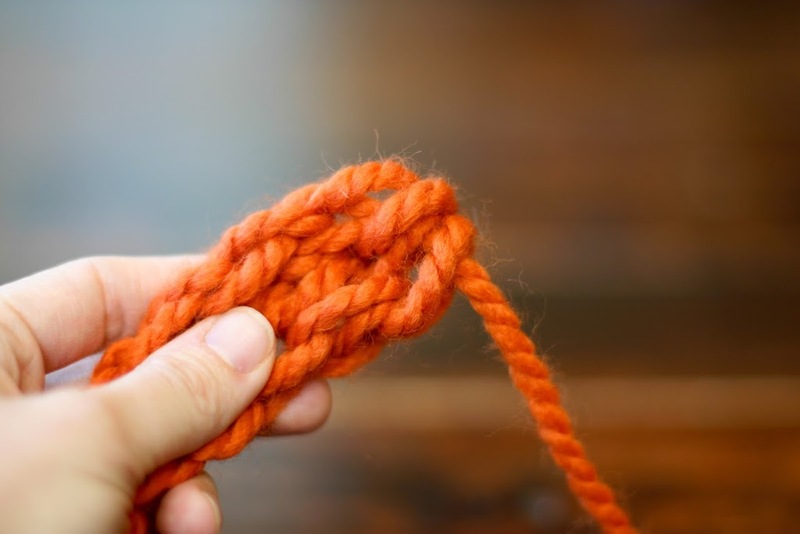 One way to make it thicker is to finger knit the finger knitting chain – you basically treat the finger knit strand as its own piece of yarn and finger knit it. 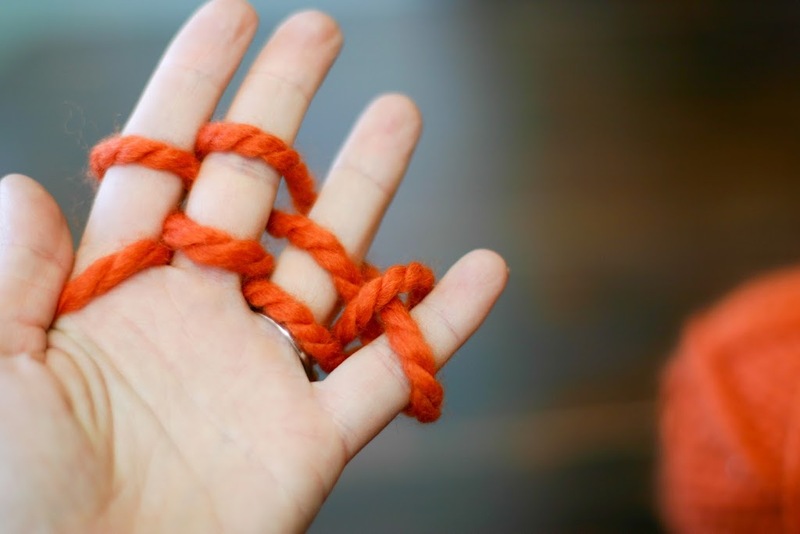 Another way is to braid finger knitting chains together. I’ve never tried seaming the strands together with the same yarn, but I think it would likely work well. I will have to try that and see how it comes out! Thanks for your comment. From an Early Childhood Teacher’s point of view…excellent eye and hand coordination which also helps the child in creativity. Might I add keep children self entertained and self accompolishment and away from todays violence. It also looks like good therapy for arthritics. My hat off to you, Anne. Will look for more of your creativities! God Bless! Good for you! I’m so excited for you guys. There are so many wonderful video tutorials online. It may be nice for you to be learning alongside him. Good luck!! I try this an it ends up looking nkthing like your pictures. One side is tight and the other is super loose and the pattern looks nothing like what you have. What am i doing wrong? Hi. I’m so sorry it’s not working out well for you. Keep practicing and your stitch will get more even and consistent. Also, after it comes off your hand, pull on the tail end a bit and the stitches will create the tube. Yes! it would be super super cute! Just pulled out my yarn and plan on teaching the kiddo’s to finger knit this afternoon!! 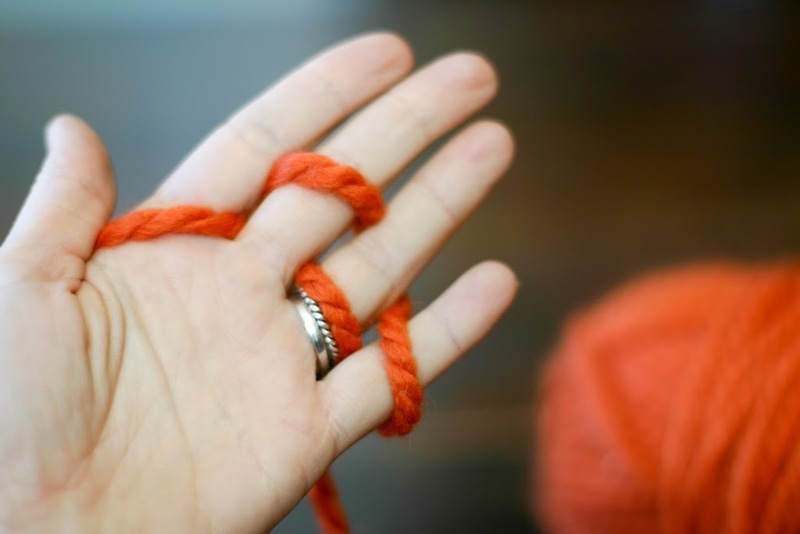 Love you blog and this finger knitting tutorial. I know this makes long skinny strands but what if i wanted to have a wider strand, more fingers? hehe, is there a way to join 2 pieces? thanks you! Hi Dina! Thanks for your comment. I wish there was an easy way to do a wider strand. You can stitch them together with thread and needle. Or, you can weave them as I do in this project: https://www.flaxandtwine.com/2012/02/woven-finger-knitting-hula-hoop-rug-diy.html . I keep meaning to try to find an easy way to knit them together in wider way, but still working on that! Thank you so much! I have an ADHD child and have been trying to remember how to start these chains! I plan on teaching his so he has something to do at school to keep his hands busy and brain ready. Thanks so much!! This will be a blessing for my 12 yr old girl who has a hand injury from birth. She WILL be able to do this!! THANKS SO MUCH! I love to hear comments like this. I hope she adores doing it! Thank You. I remember finger knitting in elementary school. I have been trying to find instructions for many years on how to finger knit, now that I am a mom. Thank you for bringing back great childhood memories. We have knitting dolloies and nifty knitters, but I’d never heard of this before. I love it! Thanks for the great instructions. I had to get a ball of yarn and try it out as soon as I saw this. Can’t wait to teach it to my dear daughter. Thank you. great ideas! Thanks for sharing!! Hi Allana! You made my day with this comment. Have fun with it! More projects to come. Great idea to make a bracelet. I am so glad you found the website and the instructions. Thanks so much for the comment! Awesome tutorial! I can’t wait to try this with my daughter! The other good thing about this method is that to adjust the tension they simply spread out/wiggle their fingers – no more little ones’ fingers turning purple! 🙂 Hope this helps! Happy knitting, and thanks again for your wonderful ideas! Liz, Thanks so much for sharing. I never thought just to bring the yarn across all the fingers like that, but it does make it faster! Cool. Oh my gosh! I just somehow happened upon your blog, and I am so excited! I used to do finger knitting when I was younger (much younger)! Every time I am in my craft room and see all my unused yarn, I wondered “how do you do the finger thingy that I used to do?” I am so excited to know how to do this again and to teach my little girl. I am ecstatic to have something to do with the yards and yards of finger knitting that she will do too (I remember having totes full of my finger knitted balls and I think I unraveled them all and gave the yarn away)! Thank you for your blog, especially about the finger knitting. You’re awesome and so creative! Bridget, how sweet! Thanks so much for your enthusiastic response. YOur reaction was exactly the one I had when I rediscovered finger knitting. You’ll find it just as much fun now :). Knit away! Is there a place to go on your sight where I can print out the finger knitting instructions, with photos, to teach my kids while we are on a trip? They are visual learners! hehe THANKS BUNCHES! Hi Deb! I do not have a pdf available yet, but it is forthcoming. I have an ebook in the works where you will be able to download the fingerknitting pdf plus directions for all the projects. Should be awesome! Maybe you could make belts and head/hairbands. I learned this as a Campfire girls in elementary school. I remember using them to hold hair out of my face. I live in Arizona where it gets hot in the summer and would use as a headband to keep the sweat out of your eyes. In the winter you can use as an ear warmer. That is what I can remember just off the top of my head. I was just trying to remember how to do this. I couldn’t figure it out. Thanks for the post. Thanks so much for your ideas Bedori! Great ideas…very useful! Thanks for sharing! Thank you for sharing this wonderful activity. I have 4 granddaughters (so far!) and will share this with them as they get old enough. I am grateful for this skill since I have arthritis in my left hand so this is perfect- no strain on using my left hand! Thanks for this sweet comment. I am so glad that this skill will enable you to keep making with less pain! Happy time with your granddaughters! enjoy it! Great tutorial. 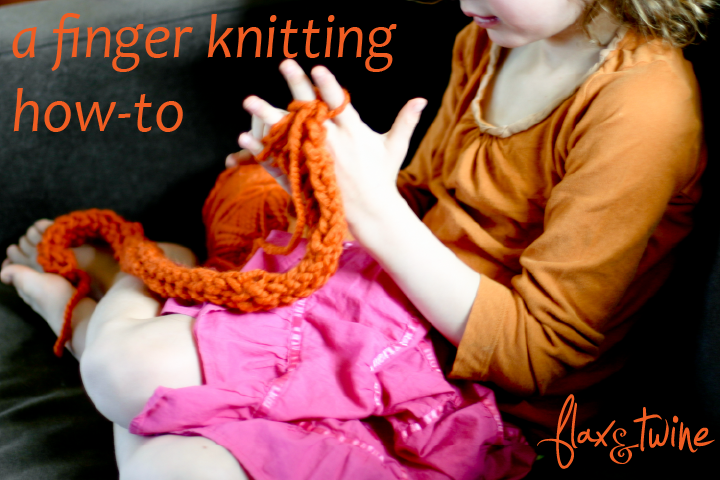 I used to do this when I was a little girl & have now taught my kids to finger knit too! I am sharing our experience with it on my blog & put up a link to your detailed tutorial. Thank you for sharing it! i made yarn out of an old tshirt and gave this a spin. it’s pretty! but I only managed to create a foot and a half long of knit… which I cant really use as a scarf… wondering if there is a way to make more knits from more shirts, and connect 3 or more to make one giant scarf? I think that is great! You can stitch the tshirt strips together to get a strip of finger knitting the length you’d like. Then, when you have three strands, you can whip stitch them together side by side to build something wider. Keep it up! Got the link from All Free Holiday Crafts email. My kids actually taught me how to do this when they were in grade school. They’re all grown up now. I was just wondering 2 days ago how to do it because I had forgotten. Thanks so much for the tutorial. Adorable kiddos you’ve got there. I’m having trouble understanding what to do with the tail when starting. the loop on my index finger isn’t tight enough because of the tail. I LOVE all your crafts. I have made almost everything on this site. A lot of stuff on this site is really great for gifts. You should definatily post a little bit on gifts. Thanks Dakota! I really appreciate your comment. Lots of fun gift posts coming up! 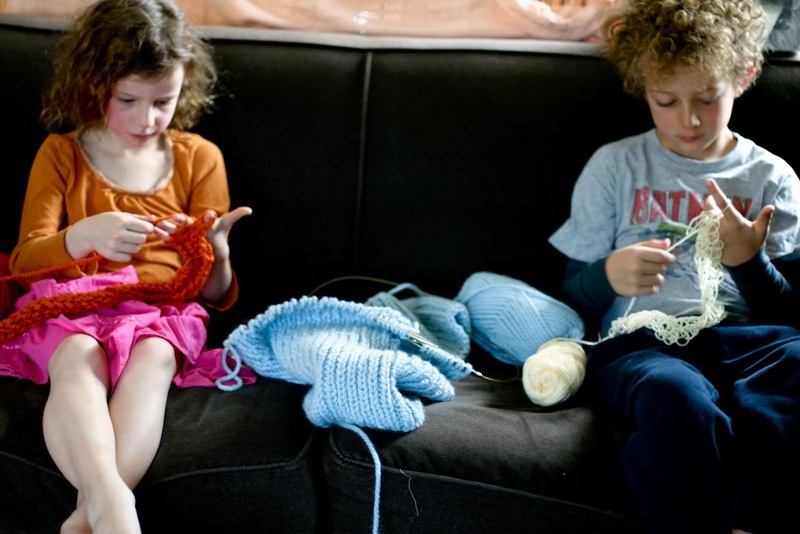 Wonderfull tutorial, I never thought the kids could knit, you gave me a grat ideea!. I will share your post on my blog, with lots of compliments to you! thanks so much for taking the time to leave a comment. I’m so glad you enjoyed the post. 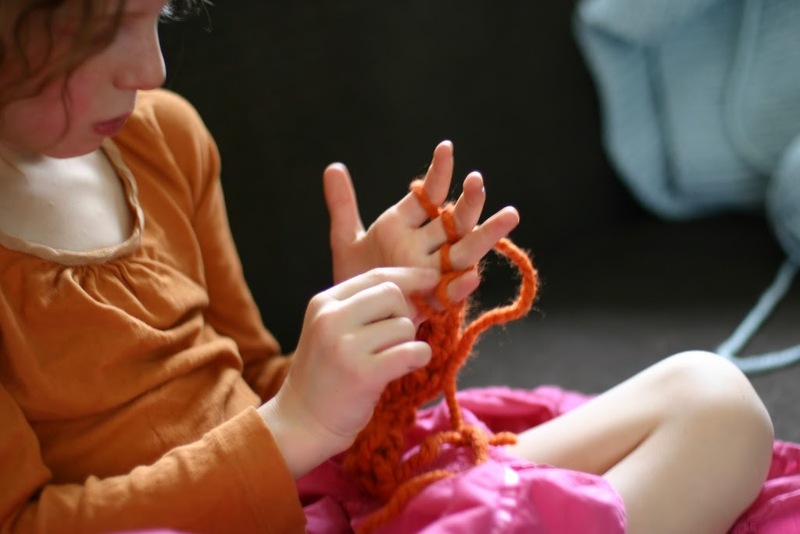 Enjoy finger knitting with your kids! I am going to teach my great-granddaughts how to do this. Can you get the scarf any wider??? Hi. You can braid strands together. You can also weave them. There are other ways you can make it wider, but I need to do a tutorial to show you. It’s hard to explain by comment. You can also fingerknit your fingerknitting, if that makes sense. Have fun! Love this! I thought I invented this when I was about 10, I never knew it was a real thing! I am going to get back to this and then actually make stuff! Fun! Thanks so much! I know I remember doing it as a child, too! I loved it then and still do! Its oddly fulfilling! have fun making! I can’t believe I’ve been knitting more than 60 years and never heard of this before. Thank you, thank you!!!! I’m addicted already and want to show everyone how to do it!!!! Thanks so much! I’m so glad you’re here. Enjoy! I love this! Thanks so much for sharing Cathy! for a something to do job if passing time. I just LOVE finger knitting! It’s always a great time passer for anyone who likes crafts! Enjoy it all! Thanks so much! It is so much fun isn’t it!? I have a question maybe you could ask? When see everyones work here on the internet I get so frustrated, because my own finger knitting gets so loose. It is not at all as tight as yours is. Mine have big holes in it. Do you know why this happens? Don’t get frustrated, you’ll get it! It takes time to master a new craft. Holes can happen because you’re dropping a stitch along the way. Do you ever look at your hand and find that a strand is missing? It could be because you pull the yarn really loose when you pull it up over your finger. 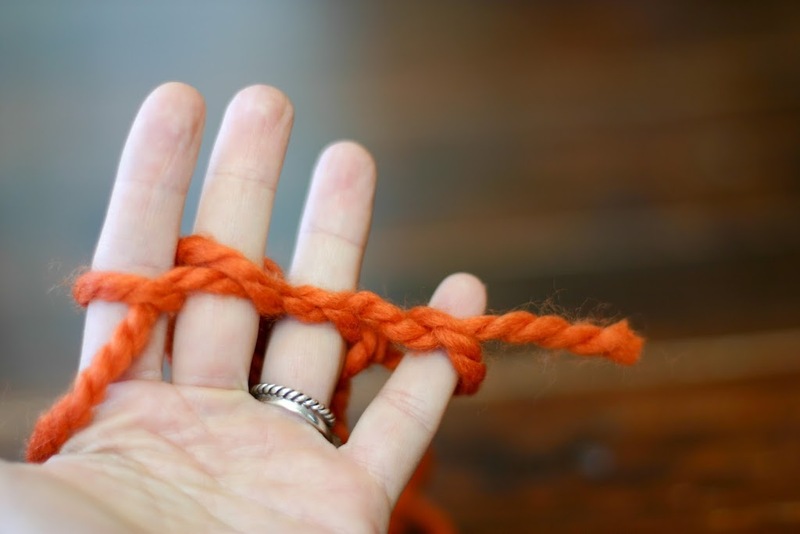 If you finger-knit more at mid-finger as opposed to the bottoms of your fingers, this could help. If you send me a photograph of your finger knitting, I may be able to help more. Send it to flaxandtwine (at) gmail (dot) com. I am wondering if you can connect them together and how? Hi Randa, You can connect them together! I have a lot of projects doing just that in my upcoming book which will be published in August of 2015. 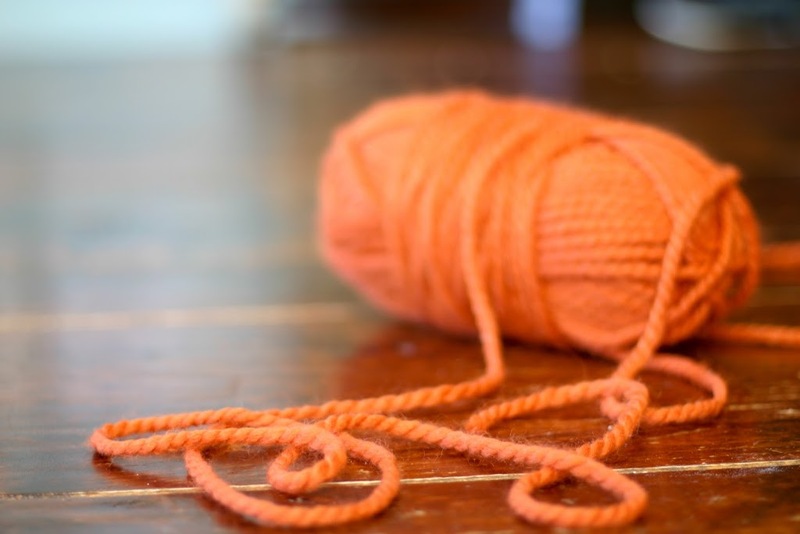 Say you ran out of your orange yarn and have to add more , how do you do this???? Do you just tie the next strand on to the end of the orange and then weave in the ends???? That’s a great way to do it Sandra. I would totally try this out! It’s so cool! Hey! Some days ago, I made my first t-shirt yarn and now i have a new finger knitted hair band 🙂 Thanks a lot! Ooh yay! Your welcome, Miriam. . . Congratulations! round plastic tube with 4 prongs at the top. You wrapped the yarn around the knobs just as you do your fingers. I would roll the strand up and sew it together. I made coasters and hot pads. I’m anxious to try this method! Thanks for the tutorial! I had kind of forgotten about it! Yes! Judy its super fun, in my book that will come out in September, there are three different methods for attaching finger knitting so you don’t have to sew them together. Finger knitting is super fun and relaxing! I love, love, love this tute. I stumbled across your Hula Hoop Weaving Tute on Pinterest this morning and set up the warp. So now, I am up to learning the four finger knit for the weft. This looks so amazing and effective. I have added your new book into my secret Pinterest Board 😉 named ‘things for me’. I want to spoil myself with something and this will be it! I love learning new crafting techniques and I am looking after a young lady tomorrow, so this will be on the hit list whilst watching Cinderella. Thank you again from your newest follower. I think you have a very creative mind, and a very supportive soul. Thank you so much for sharing these terrific ideas with the rest of us. When my children were small, I was a Girl Guide leader, and the most fun we had was crafting with what seemed to be the most insignificant and inexpensive supplies. We spent one rainy camp weekend making origami dogs and cats out of scraps of paper. I see some of those girls occasionally in the neighbourhood or the grocery store – I don’t recognize them at first, but they always recognize “Sunshine” – makes my heart warm. The same will happen to you too! Thanks again, and keep up the good work! Aww – what a beautiful comment. Thanks so much for sharing. Yea, nice post today, allways a pleasure to see before work. Thank you so much for this tutorial! The necklace is precious. My daughter would like to finger knit a paracord bracelet for her brother but we can’t figure out how to knot/tie the ends to form a bracelet. Do you have any suggestions for turning this into a bracelet? Hi! I’m so glad. You can attach the paracord to a speed clip which you can find at your local craft stores. I have detailed instructions on how to do this in my finger knitting book, Knitting Without Needles. Thanks so much! Thanks for your reply, I can’t wait to get your book. Had just found your blog yesterday & love it!